Indonesia is home to many traditional dance styles, and the classical dance traditions of Java and Bali have attracted worldwide attention. In Java, classical forms blend native traditions with stories and dance techniques from India. The forms have evolved over the last 200 years from the dances of Java’s former Islamic-influenced courts and today are centered in Yogyakarta, Surakarta, and Jakarta. The most significant of the Javanese court dances are the bedaja and the serimpi. Slow and restrained, women dancers move solemnly to the accompaniment of the gamelan and choral singing. Javanese mask dances (wayang topeng) have been traced to the 11th century. In these, dancers with wooden masks based on traditional three-dimensional rod puppets (wayang golek) act out stories from the Mahabharata, the Ramayana, and local tales. The most famous of these tales is The Adventures of Prince Panji. Another significant dance drama is the wayang orang, in which men and women act out a familiar range of Indian and local epics. In the wayang orang, dancers dress and act in a style adapted from traditional shadow puppets (wayang kulit). Bali has a rich tradition of dances that are part of religious rituals. Often performed by nonprofessionals, dances are held in temple courtyards and coincide with religious feasts. The sacred baris gede is a battle dance performed by men, while another secular form of baris has been developed for the tourist market. Women dance the sacred rejang to evoke beauty. 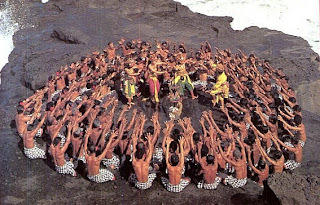 Bali is also well known for its trance dances, in which performers experience an altered state of consciousness and seek contact with the spirit world. In the Sang Hyang, a genre of trance dances in remote villages, men are believed to become possessed by animal spirits that bring about ritual purification of the community. Adolescent girls dance the Sang Hyang dedari. The Balinese perform versions of Java’s wayang wong and wayang topeng, but the legong is Bali’s best-known dance. Two or three young girls perform the dance, which tells fragments of stories from the life of Prince Panji. The legong dates from the 18th century, although it draws on older traditions. Several regional governments pay performers to dance, both to foster identity and to promote tourism.